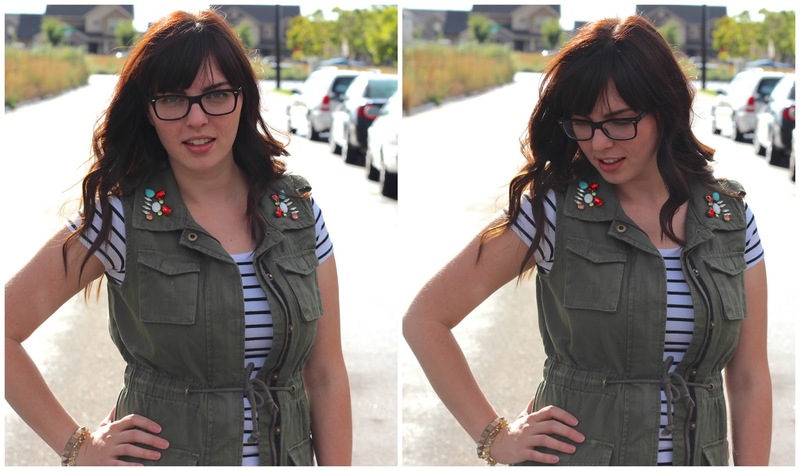 Janelle In Real Life: military vest. Yesterday's weather was cuh-razy with all these random thunderstorms and what not. I made my hubby come take some outfit pics during a break in the rain, and there were no great photo taking spots! The sun was in a weird spot, some kids had left an absurd amount of toys strewn across the sidewalk and grass, and I was just not feelin' it. We couldn't wander too far because we'd just stuck the little guy in his bouncer with some cheerios right in front of the sliding glass door so we had like... 5 minutes max before he got bored and started screaming for attention or to be let out of baby jail (his bouncer). So we opted for the classic middle-of-the-street pics. And to be honest, I am really proud of myself for wearing something that took any effort at all. I'm probably breaking down my hard-earned style blogger facade by admitting that some days I don't really look all that put together... but hey, we all have those days right? Or weeks. Whatevs. Forever 21 gift card giveaway which ends TONIGHT! 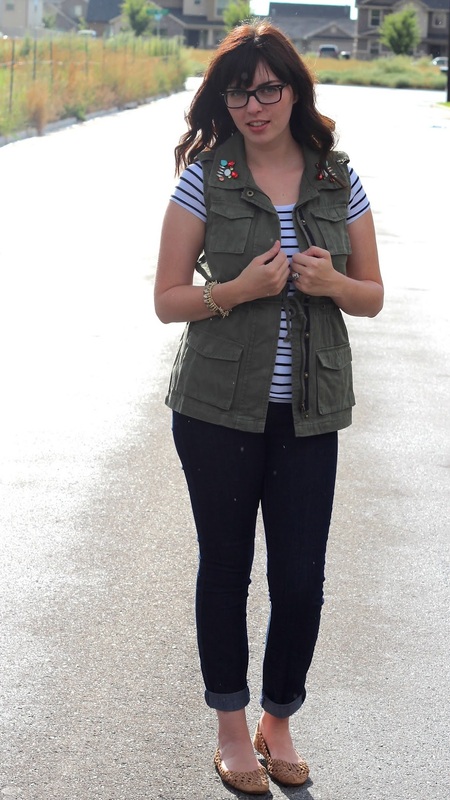 Wow—love that vest! The little jewels are such a fun touch. Yay! 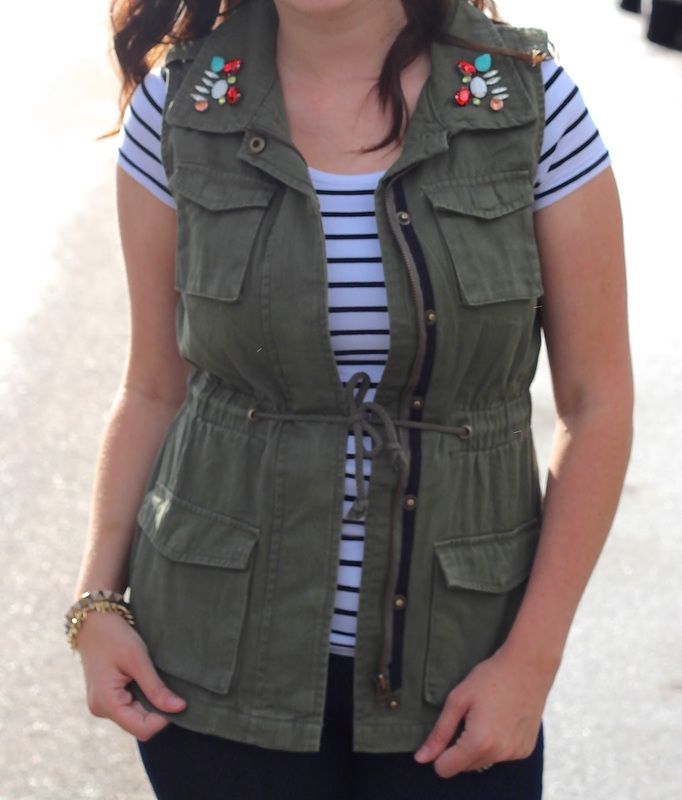 Love how you styled your vest! I hope you love it! I do love it! Such a good piece for fall. Thank you! I seriously love these jeans... tj maxx is the best! haha baby jail- loved that. and i sometimes get so frustrated with finding a spot too- sometimes i get bored of the ol "pose in front of a brick wall" routine. and LOVE your outfit!! it's so pretty. admittedly i don't get puled together til 1 oclock every day haha so you're not alone! Well I'm glad I'm not alone there! Haha. Super cute! I love the vest and the shoes. Totally wore this today...minus the striped shirt! 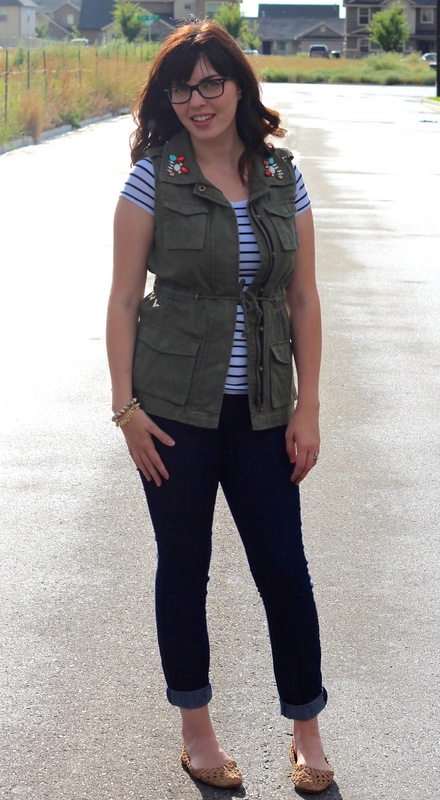 I love my glammed-up army vest from JCP!!! It's such a great vest! Glad you're loving it too! That vest is awesome! Love your style! I really like the embellished collar on the vest!